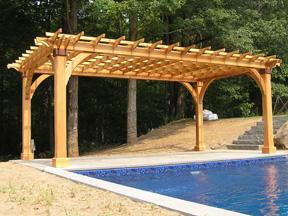 To discuss your pergola project, please call us at (302) 658-5186 or complete our Pergola Quote Form. 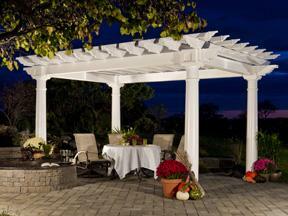 Our zero maintenance Fiberglass Pergola leads the fiberglass pergola industry. We notch all our joints and have the strongest parts available. 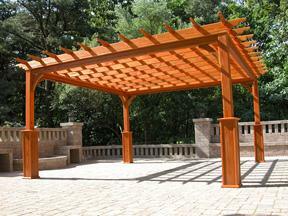 Craftsmanship and zero maintenance rarely meet each other, but these pergolas are an exception. A 10' x 14' foot patio will support our 12.5' x 16.5' Fiberglass pergola. 14' x 18' patio = 16.5' x 20.5' includes 12" inch diameter columns. What's included: Fiberglass columns, fully assembled double 2x8" main beams, true 2x8" rafters, true 2x3" purlins, all hardware, instructions and warranty. Popular upgrades: Shade systems, attachment to house, square columns, architectural column capitals, copper flashing, unlimited color options. These cedar pergolas exude craftsmanship with their many fine details such as notched joints, arched gussets and an assortment of rafter tail profiles. Cedar has a natural warmth and soulfulness that cannot be quantified. A 10' x 14' foot patio will support our 13' x 17' Fiberglass pergola. What's included: 6x6 posts, arched gussets, knotty grade cedar, 2x8 beams, boots, 24" overhang, 8' tall. All hardware, instructions and warranty. 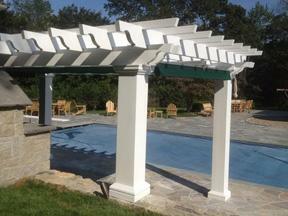 Popular upgrades: Shade systems, attached to home, 8x8 posts or fiberglass columns and unlimited color options. 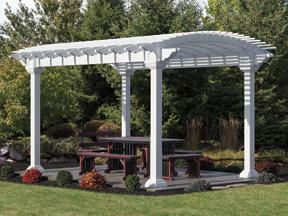 Our zero maintenance vinyl pergola is the perfect choice for most homeowners. It's really just a pressure treated pine pergola with vinyl sleeves and end caps. A 10' x 14' foot patio will support our 10' x 14' vinyl pergola. What's included: 6x6 Square vinyl posts with top and bottom decorative trim, true 2x8 double main beams, chunky true 2x6 rafters, 2x4 purlins, all hardware, instructions and warranty. Popular upgrades: Shade systems, leg base trim or leg upgrades to 8x8" square or 10" round. Almond color available.. This arched top vinyl pergola is exactly the same as our flat top pergola except for the graceful arching rafters which we are so proud of that we had to add this section. It can be customized in width or depth. What's included: 6x6 vinyl posts with top and bottom trim, true 2x8 double main beams, chunky true 2x6 curved rafters, light gauge roof slats, all hardware, instructions and warranty. Popular upgrades: Arched top shade systems, leg base trim or leg upgrades to 8x8" square or 10" round. This pergola is inexpensive, but you sacrifice nothing. It's quite beautiful and will support any shade system. What's included: 5x5 posts with post skirts, small arched braces, 2x6 rafters, 2x4 purlins, generous overhangs, all kiln dried, southern yellow pine with powder coated mounting brackets, all hardware, instructions and warranty. Does not include any stain or finish coat. Popular upgrades: Lattice roof, superior posts, electrical package, shade system. Many colors to choose from.